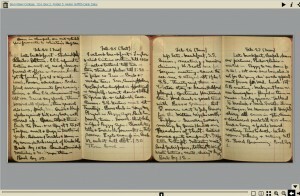 Click the image to view this diary in a page-turning viewer. The diary of Helen Griffith, documenting her time at Bryn Mawr College. In it she describes her day to day schedule including classes she did and did not attend, gossip about friends, and her meal schedule. Occasionally she offers her opinion on what’s happening at the college. There are occasional time skips with the latter part of the diary documenting her post graduate life.